Batman and Robin are holding Poison Ivy at the Batcave. But look out! Bane has broken into the Batcave in his awesome spinning drill tank and is trying to rescue Poison Ivy. Help Batman and Robin put Bane back behind bars where he belongs! 5 minifigures: Bruce Wayne, Batman, Robin, Poison Ivy and Bane. Batman and Robin are holding Poison Ivy at the Batcave in this LEGO playset. But look out! Bane has broken into the Batcave in his awesome spinning drill tank and is trying to rescue Poison Ivy. Help Batman and Robin put Bane back behind bars where he belongs! LEGO model number: 6860: Includes 5 minifigures: Bruce Wayne, Batman, Robin, Poison Ivy and Bane. For ages 7 years and over; EAN: 5702014842304. WARNING(S): Not suitable for children under 3 years old. 1 Question 1 Answer Batman and Robin are holding Poison Ivy at the Batcave. But look out! Bane has broken into the Batcave in his awesome spinning drill tank and is trying to rescue Poison Ivy. Help Batman and Robin put Bane back behind bars where he belongs! Includes 5 minifigures: Bruce Wayne, Batman, Robin, Poison Ivy and Bane. 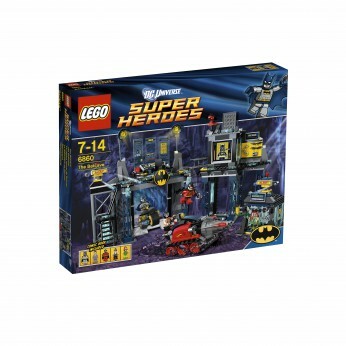 This toy costs approximately £66.99 (for the latest and best prices make sure you check our retailer list for the LEGO Super Heroes The Batcave 6860 above). In our review of LEGO Super Heroes The Batcave 6860 we classed it as being suitable for ages 3 years, 4 years, 5 years, 6 years but recommend you check the manufacturer specific advice before purchasing.